Lead detective Robert Mann has over 25 years of success completing complex national/international investigations working with alongside some of the most renowned attorneys in America. As an accomplished California and New York Licensed Private Investigator, he has expertise in diverse areas of private investigative services such as; suspicious workers’ compensation claims investigations, criminal and civil investigations encompassing embezzlement; counterfeiting; intellectual property infringement; conspiracy; identity theft; asset location and recovery and personal protection services. Mann is culturally savvy and global minded with expertise in interviewing, researching, assessing, writing/editing, and preparing concise investigative reports. He has a keen understanding of the law having worked with some of the finest law firms in the country and he has been involved with some astonishing and epic cases. Robert is fully knowledgeable in evidentiary procedures and the validation of admissible evidence, as well as applicable fraud statues at the State and Local levels. Robert possesses superb communication skills, is a published author and he is proficient in Spanish. 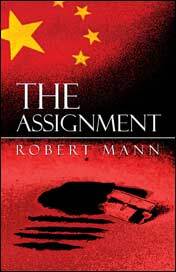 Inspired by an actual investigation conducted by Robert Mann, This fictional novel is based upon a true story, The Assignment is a riveting suspense novel based on Robert Mann’s real-life encounter with the world’s largest criminal cartel in South East Asia and China.